While all the suggestions work, they just don't seem to last and again Hugo feels sad once again. Finally Magic Manta helps him find the real meaning of happiness. It isn't what you get in life it is giving without expecting anything in return. As Hugo shares his heart he gains true happiness and that cannot be taken. This book was a great book. My 5 year old really loved seeing all the happy things he did. I really recommend this book as a way to help your child learn empathy. There is good reason that the book was a Best Books Award Finalist from USA Books News! 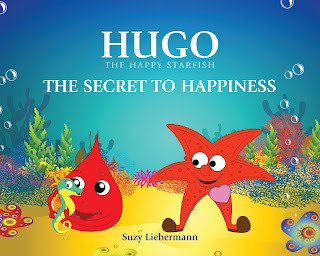 If you are looking to buy Hugo The Happy Starfish The Secret To Happiness make sure to head to Amazon and pick up a copy. This book is also available in German HERE.